We were treated to Scottish heritage and culture: fine art, folk dance and music, history and food (Yes! we ate haggis, neeps and tatties), and heard a bit of the unique Scottish "English". 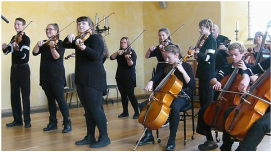 We had a wonderful workshop on Scottish fiddling styles and embellishments taught by one of Scotland's foremost fiddlers, Alistair McCulloch. 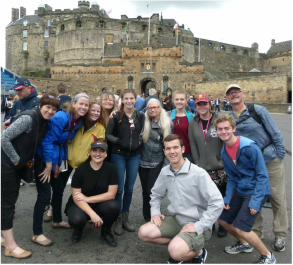 Scotland's Stirling Bridge International Youth Arts Festival, July 2016. We performed over 7 days, sometimes performing twice in one day, in the cities of Stirling, Edinburgh, Glasgow, the Highlands, Perth, Ayr and Burns Country. The Festival took place in many different settings including ageless churches, historical town halls, market squares, contemporary theaters and medieval castles. The Fiddle Club has a wide repertoire of Celtic pieces but for the Scots they featured a selection of all North American music with Folk, Bluegrass, Western Swing, Blues, Jazz. and as we hail from near Detroit-Motown. These pieces feature solos improvised and performed by our young players along with their wonderful singing and choreography.